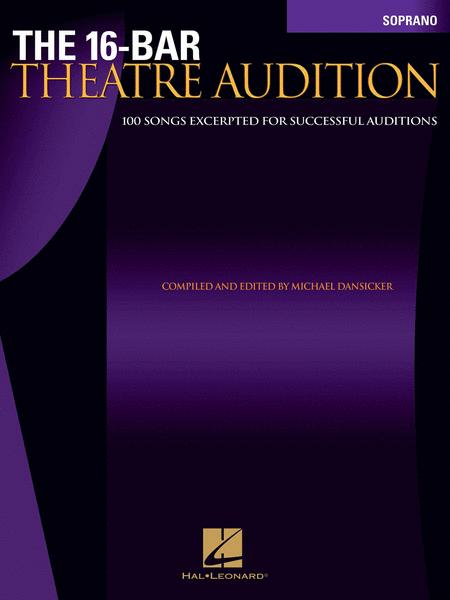 100 Songs Excerpted for Successful Auditions. Edited by Michael Dansicker. Vocal Collection. Broadway, Movies and Pop. Songbook. With vocal melody, lyrics, piano accompaniment, chord names and introductory text. 159 pages. Published by Hal Leonard (HL.740253). ISBN 063406343X. 9x12 inches. Compiled and edited by Michael Dansicker. Most large audition calls for musical theatre, both professionally and in larger school situations, specify that those auditioning bring in a 16-bar excerpt. The professionals in musical theatre often complain that singers don't know how to construct an appropriate 16-bar audition, either in choosing a song or in editing an excerpt. With this new series, that problem is solved forever! Editor Michael Dansicker, a composer/producer/music director, is a seasoned musical theatre veteran, with 100 Broadway credits. He brings his expertise and broad knowledge of the literature to this series. Each excerpt has been given a thoughtful, graceful and effective form. No more illegible scribblings for the poor audition accompanist! An enormous variety of literature is represented, from old standards to movie songs to the latest Broadway and Off-Broadway material. With 100 songs per volume, any singing actor, whatever his or her talents and strong suits, will have many choices. In the preface, the editor gives valuable pointers on the nature of a good audition and some factors in choosing songs. Do I Hear A Waltz? From Do I Hear a Waltz? People Will Say We're In Love From Oklahoma! What Is A Woman? From I Do! I Do! I Like Him From Drat! The Cat! August 22, 2007 Great resource! This is definitely one of my audition must-haves! All the work of editing a song is done for you and showcases great range. And there's plenty of selections to choose from. 29 of 55 people found this review helpful.